The Speaker of the National Assembly of the Republic of Serbia Maja Gojkovic convened the 20th Special Sitting of the National Assembly of the Republic of Serbia, 11th legislature, for Monday, 28 January 2019, starting at 1.15 pm. For the sitting the Speaker set the following agenda bearing one item: H.E. Borut Pahor, President of the Republic of Slovenia, to address the National Assembly. As the President of the Republic of Slovenia H.E. 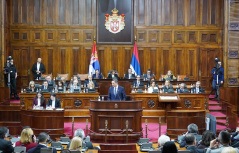 Borut Pahor completed his address, National Assembly Speaker Maja Gojkovic concluded the 20th Special Sitting of the National Assembly of the Republic of Serbia, 11th legislature.